Your loved ones have enlisted in the United States Marine Corps and now YOUR journey begins as well. As they get ready to leave for boot camp they are busy preparing for their career as one of "The Few, The Proud." One of the most important steps for loved ones at home is already completed! You have joined Recruit Parents and are well on your way to becoming informed, educated and supported by others experiencing the same emotions. The recruit parents website is filled with links and information. These links are located on the right side on your computer or at the bottom of your mobile device and include numerous topics including boot camp, graduations, and articles we've written on becoming a Marine Parent; articles written by parents, for parents. For many families, the need to stay busy during recruit training is satisfied by learning what the Marine Corps lifestyle will be like. Learning the importance of Operational Security, your Marine's Chain of Command, Privacy and Respecting the Corps will ease your transition to the military lifestyle. Whether you are familiar with these terms or are completely new to the terminology, you'll learn something about being the parent of a Marine. 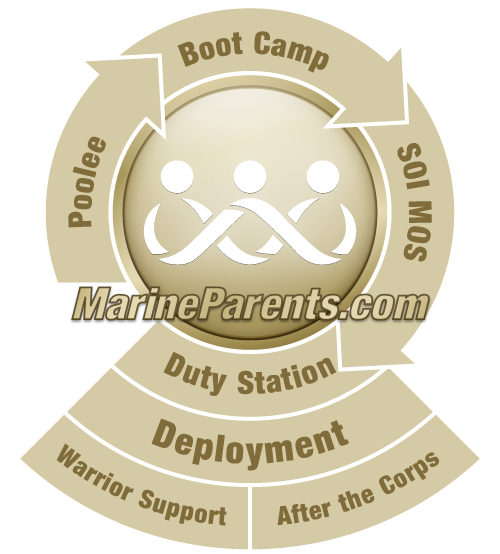 Fasten your seat belt and join the thousands of other parents and family members on this rollercoaster ride we call Marine Corps boot camp—it's not just for recruits! I feel more pride, more compassion, more respect...for my son. Being here on this site has been the difference. I read how all the other parents have gone [through] and are going through this change and I find that I'm gaining strength through these very people. We are all in this together and I'm very happy about that. I hope that you find the peace and comfort that I have found here with MarineParents.com." 100% of the proceeds from the EGA Shop benefit the outreach programs of MarineParents.com, Inc. Click here to shop now!